I love carb-loading. The Hubby and I look forward to Thursdays + Fridays each week because we get to stock up on carbs for our weekend long runs. It might be my favorite part of race training. Carb-loading is tricky business. It is not adding a whole bunch of carb calories to what you’re already eating those days. Carb-loading is upping the ratio of carbs in your diet on those two days leading up to a long run. Our favorite way to carb-load: heavenly soft breadsticks. Oh my. 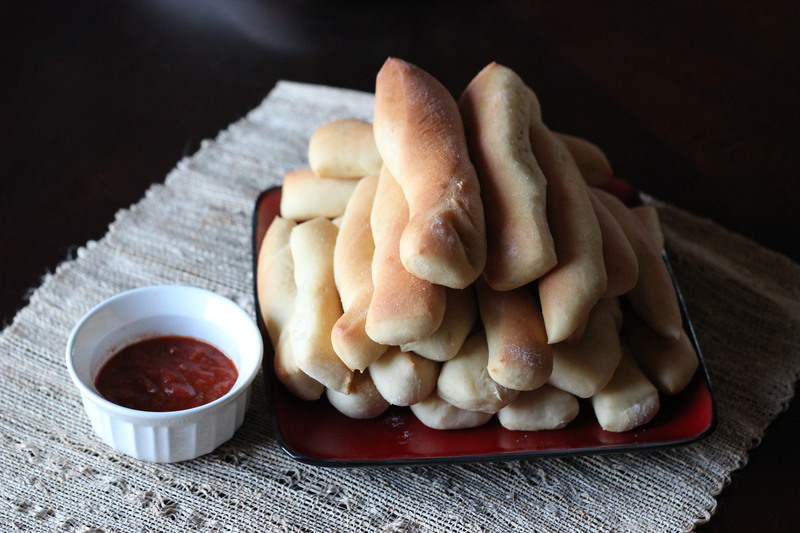 We already have every Friday designated as homemade pizza night, so adding breadsticks to the menu makes sense. 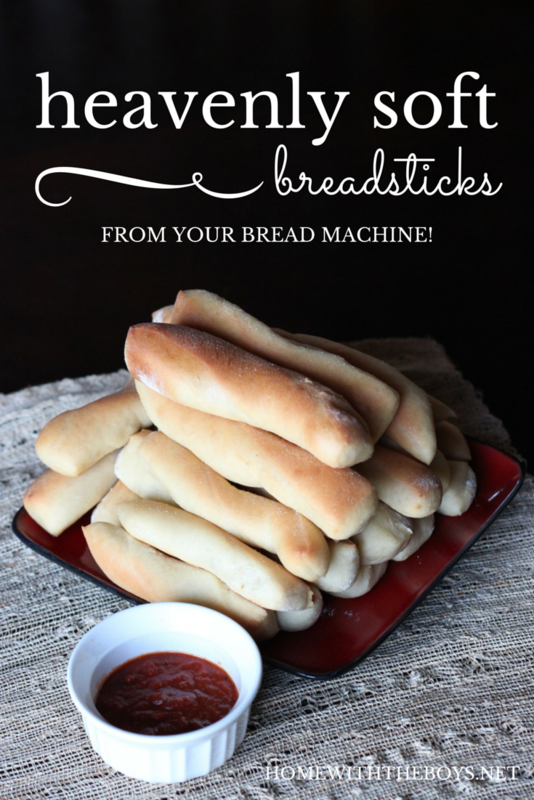 These breadsticks are SUPER easy to make and absolutely delicious! We’ve been making them for years and they never, ever disappoint! After seeing these pictures, I’m sure you’ll be ready to down some of these carbs yourself, so I’ll share the recipe. The best part of this recipe for me is the use of the bread machine to make the dough! God bless bread machines. I love throwing everything in the machine and letting it do all the work of mixing and rising and kneading! You’ll need to start the process about 2 – 2 1/2 hours before you plan to eat to allow for the bread machine time, extra rising after they are cut into sticks, and baking. I have had this (affiliate link) Oster Breadmaker since we got married 12 years ago and it still works perfectly! I mostly use it for the dough setting because I still like baking bread in the oven. 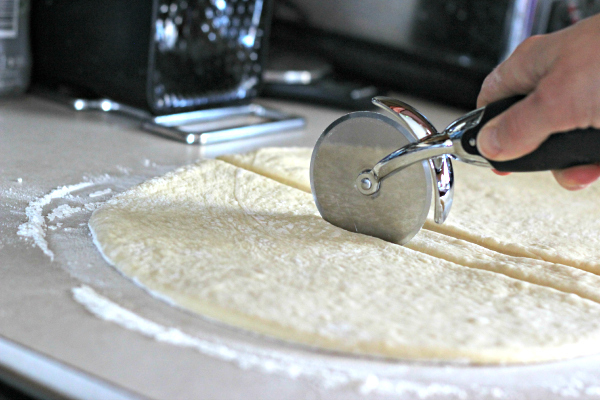 A pizza cutter works like a dream for cutting the strips from the dough! I wish I would have figured this out years ago! SO EASY! The recipe calls for bread flour, but all-purpose flour works just as well. I have always used extra virgin olive oil, so I can’t tell you how other oils would work. If you try another oil in the recipe, let me know how it turns out! Who is ready to make some breadsticks?! Read a book, watch some TV, go for a run – let the bread machine do the work! 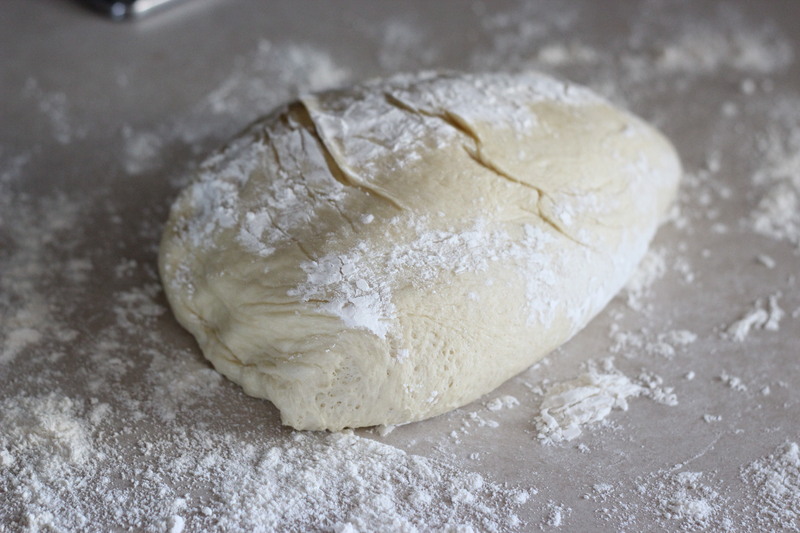 When the dough is completed, roll it out on to a floured surface into a 10×12 inch rectangle. Let breadstick dough rise for at least 20 minutes or more if you have time. Brush with butter and sprinkle with garlic salt and/or Parmesan cheese. 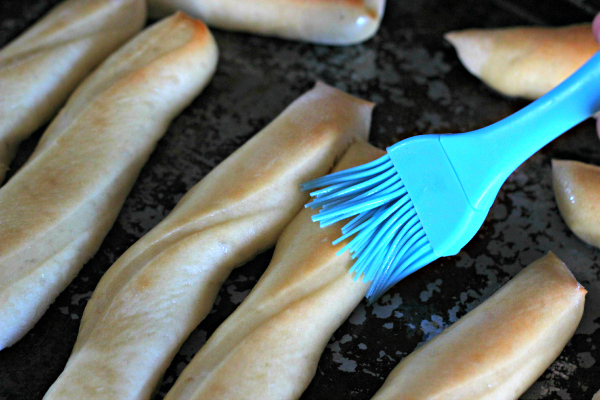 I think I may need to try these as dessert breadsticks next time! A little cinnamon sugar sprinkled on top instead of garlic or cheese?! Yum! How would you eat these delightful bits of heaven? Could you share which bread machine you have? Thx! Love your blog! Um what if I’m not going for a long run, can I still eat 12?